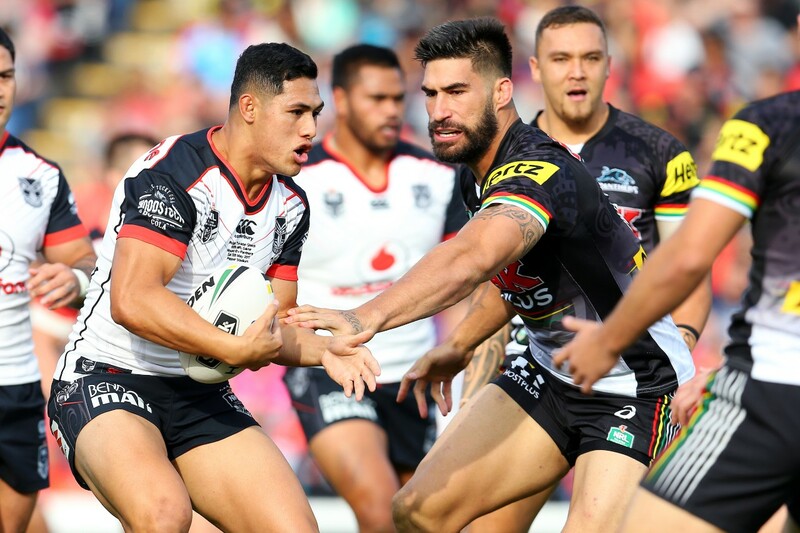 After the Round 9 close victory over the Roosters and a week away from the NRL for international duties, the Warriors travelled to Pepper Stadium to face the Penrith Panthers. After two rounds where the Warriors defence was a highlight this performance highlighted the Warriors defence in a negative light after the Warriors blew a 22 point lead to lose 36-28. For the third round in a row, the Warriors started strong with Kieran Foran scoring 6 minutes into the first half. The Panthers tried to strike back until David Fusitua snatched an intercept and ran the length of the field only to be tackled by a determined Waqa Blake 10 metres out, Waqa held onto to David too long and was sent to the bin. The Warriors took quick advantage of one man overlap with two tries in quick succession to Charnze Nicoll-Klokstad and Ryan Hoffman. The Panthers attempted to claw their way back into the match with a try to Isaah Yeo at the 25-minute mark. Kieran Foran put a stop to that comeback attempt as he slotted a 40/20 on the next drive which leads to another try to Charnze Nicoll-Klokstad after a perfectly weighted grubber from Foran. David Fusitua mirrored his play from earlier in the half and grabbed another intercept but this time managed to evade Waqa Blake to cross the line at the 40-minute mark to take the Warriors to a 28-6 lead at the break. In the second half both the teams swapped ends and also swapped their form as the Warriors had nothing left to offer as the Panthers started to mount a comeback. Isaah Yeo crossed 7 minutes into the second half, and the tries just kept coming with tries to Dallin Watene Zelezniak, Waqa Blake and Matt Moylan in the space of 10 minutes to give the Panthers a 30-28 lead going into the final 20 minutes. My Warrior of the game goes to Charnze Nicoll-Klokstad. In only his second outing in first grade Charnze is showing great potential, with Manu Vatuvei getting injured yet again and Ken Maumalo not performing consistently at first-grade level, Charnze has a great opportunity to cement a spot on the wing. Although he is smaller than the wingers we have grown accustomed to on the Warriors edges, he has speed, is safe under the high ball and is defensively sound. My Warrior who needs to improve is Roger Tuivasa-Sheck. Roger came out after this match and said it was the worse 40 minutes of his career and I couldn't agree more, he had a right shocker in this game. In a game where all the Warriors performed poorly in the last 40 minutes you could really pick any of them but given how well Roger has played this season to date I had to pick him. His performance was out of character, missing tackles and making unforced errors. I am confident that Roger will bounce back from this and make this performance nothing but a bad memory. Well, where do you start after a performance like that? After the past two rounds, I thought the Warriors had turned a corner this season and had started to show a defensive edge to their game. I have no idea what happened in this match, in the first half it looked like the Warrior's attack was finally starting to click and as a result, the points started to pile up. Their defensive pressure lead to two intercepts by David Fusitua and the Warriors looked well on their way to a high scoring win. And then there was that second half, up by 22 points the Warriors had this game well and truly in control and were well on their way to obtaining victory. 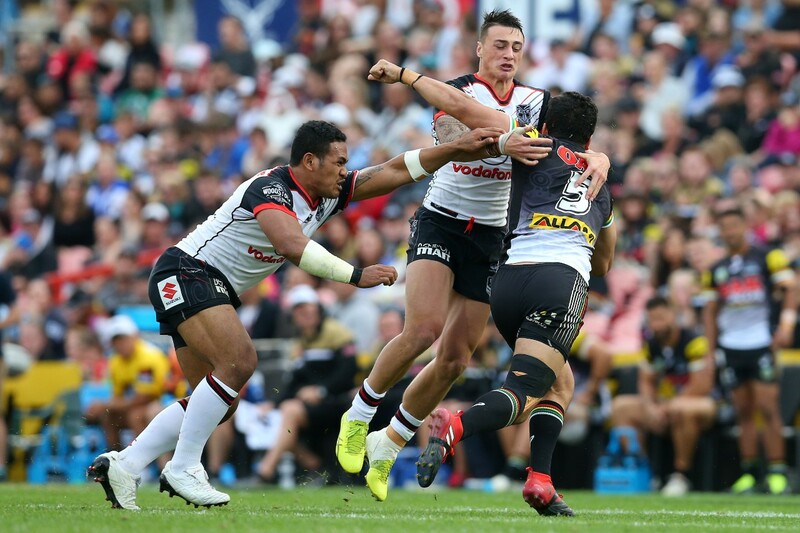 The Warriors appeared to think the game was over and were punished as a result, Simon Mannering's absence was noticeable as the Panthers were able to break the line in the middle with relative ease. The Warriors never seemed to be in this match once that second half start, they were mere spectators in an embarrassing display. A collapse of this nature can not be tolerated in a competition as close as the NRL. This performance is not the end of the Warriors season by any means but it has got to have set off some alarms at Warriors HQ. Stephen Kearney and Co need address the lacklustre attitude that was so apparent in the last 40 minutes and talk to all the senior players that did not step up when the game started to get away from them. If the Warriors cannot fix this attitude and learn to play for 80 minutes then it is going to be a long season for this team and fans alike. This round the Warriors travel down to Hamilton to face the St George Illawarra Dragons, after their last performance, facing the Dragons is not an ideal situation given the Warriors poor record against the Dragons. If the Warriors can go back to how they were performing against the Storm and Roosters then they give themselves a decent chance at getting a win here. Having Ben Matulino back with the side should help combat the Dragons large forward pack in particular Paul Vaughan who has been a standout for the Dragons in 2017. The Warriors need to get the win here, not only to keep them in the hunt but also to calm the ever vocal fan base that is frustrated with how this team has been inconsistently performing, so I'm picking the Warriors to get the win here by two. So that Round 10, a loss that many including myself would like to forget, and as per usual I will leave you with some questions. How would you change the attitude in the Warriors camp? Is there still a chance the Warriors will play finals football in 2017? Do the Warriors have a young player they can mould to be the next Simon Mannering? What chance do you give the Warriors in getting the win in Hamilton this week?